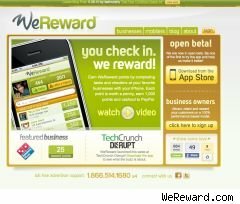 For anyone who Tweets, posts on Facebook, uses Foursquare or other ways to tell people where they are and what they're buying, WeReward.com has a way to turn what they're already doing for free into some money. While you won't get rich using WeReward for chronicling your purchases via a photo on an iPhone at any of its 15 million business partners, you at least won't have to put a photo of your cheeseburger and fries online for the world to see. Only the merchant has to see it to confirm you bought its product at its store. It's like Facebook or Twitter for shy people, but with a few pennies or dollars thrown in, depending on the business. "Our goal is to try to save people about 20%, on an average ticket," WeReward CEO Ted Murphy told WalletPop in a telephone interview. While only three weeks old and 10,000 users for the iPhone app, with a Droid app coming in mid-July, it can take a lot of spending to get money back -- which comes through PayPal and starts when $10 is saved up in reward points. One point is worth one penny, so it would take 1,000 points to get $10. 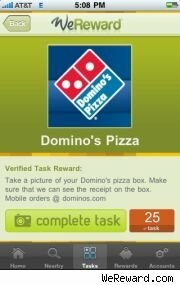 Domino's Pizza offers 25 points for buying a pizza, which equates to a discount of 25 cents. I'm all for saving money, even a quarter, but taking a picture with your cellphone while you eat a piece of pizza, and then sending it to Domino's for confirmation to get the quarter, seems like a hassle I'd rather avoid. And eating 40 pizzas to get $10 in savings is a lot of heartburn. Domino's is in pilot mode with the 25-cent discount, Murphy said, and hopefully will increase the amount. The average discount form the app is $2 to $3, or 200 to 300 points, he said. Points are awarded on a fixed amount, not a sliding scale, so spending more money at a participating restaurant or retail outlet won't result in more points earned. There are three ways to get points. One is by a "check in," where you take a photo from your cellphone of you eating at a restaurant, and your location is verified through the phone's GPS. The second is through doing what the website calls "tasks," such as taking a photo of you drinking a specific soda, for example, but not at a specific site. It can be at your home. Some "tasks" don't require buying something, but to check it out at the store and have your photo taken with it for verification. The third way is to refer friends, which gives you 10% of their verified "check in" awards. All of the methods recommend using Twitter, Facebook and other social media to share your purchase, but it isn't required. Murphy said he expects the app's users to post their purchases on social media, since many are already doing it. Murphy, who is also the CEO of the social media marketing site IZEA, has also paid bloggers to write about products, and pays people to promote products on Twitter. WeReward makes the social media aspect optional, which might be best for anyone who doesn't want to share everything they buy with the rest of the world.